And then some! 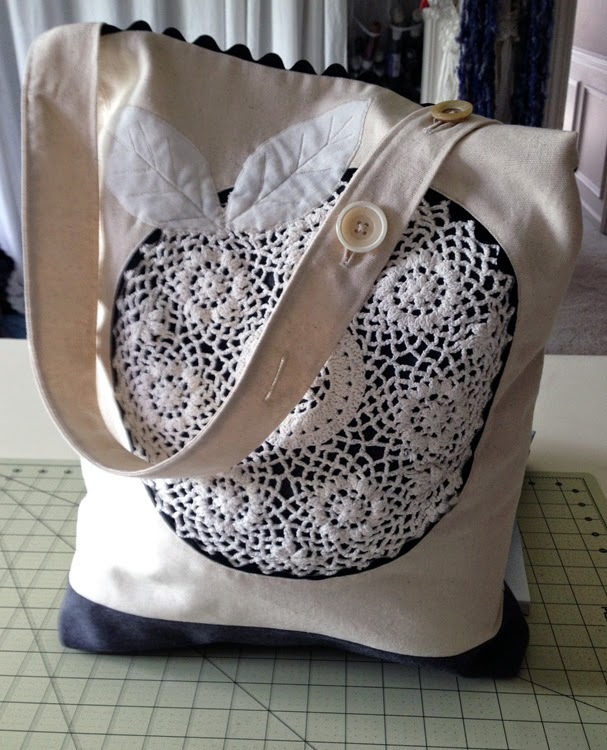 I found this Doily Flower Tote Bag tutorial at Sew Mama Sew blog, and knew I wanted to make it. I had everything I needed in my stash. 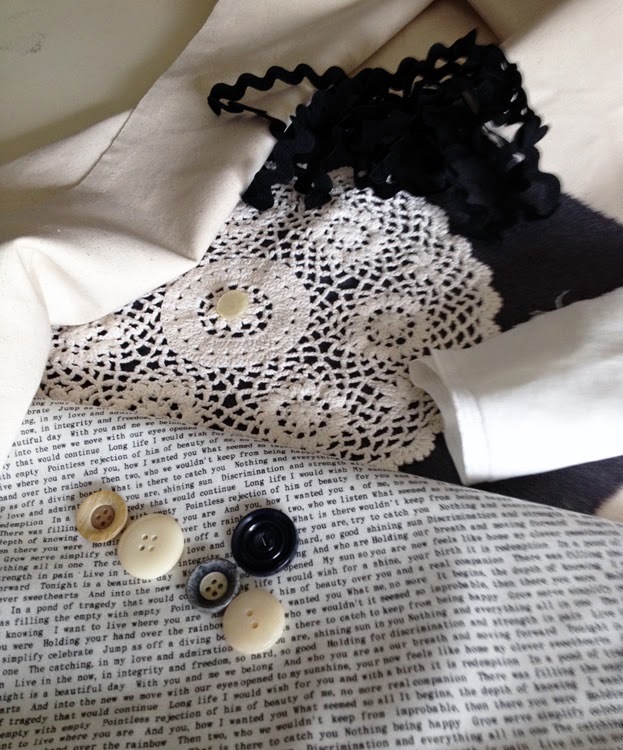 Charcoal linen fabric thrift-ed for $3.50, for 5 yards, canvas fabric, book text cotton for lining, a vintage doily, white cotton velveteen, vintage buttons, and black rickrack. The tutorial by Brit, Karen Myers was excellent and full of photos, love that! 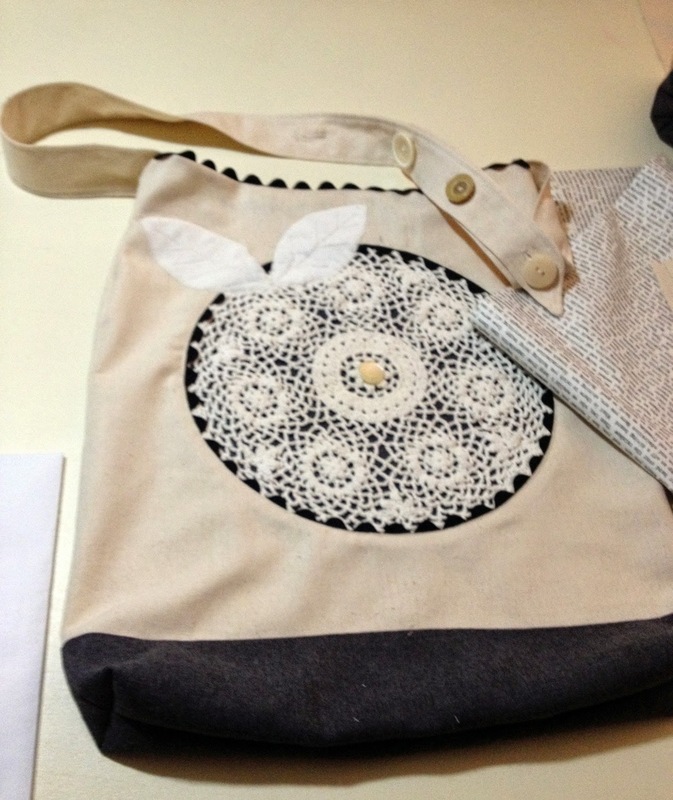 She also sells these Doily bags in her Etsy shop if you love the bag but don't want to make it yourself. 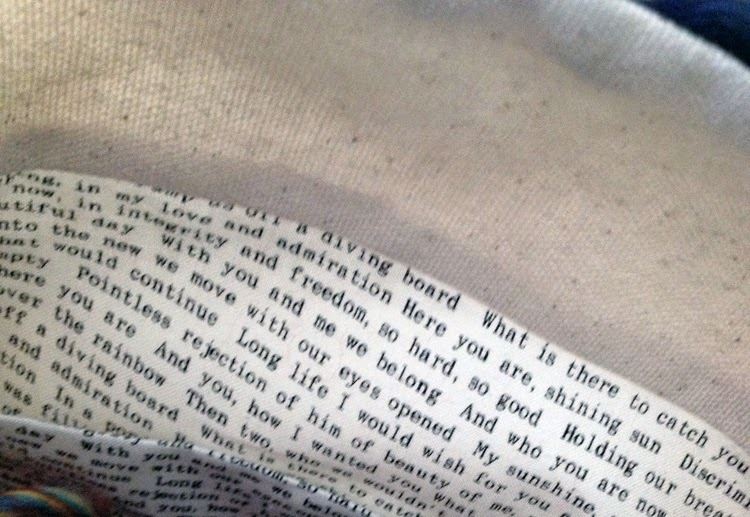 I was just in the mood one day, a couple of weeks ago and really enjoyed stitching it up. I finally had some time today, to finish up the lining. I made mine a little longer and added the charcoal contrast band at the bottom. Next, is the table/cart for a friend's daughter. She has graduated from college and is starting a new job, in a new city. This will serve as a small dining table with great storage! I really like the fact that it is on wheels. This piece will be useful for many years to come. It is sturdy and Mr. B. custom made the oak top (which is removable, 2'x4') and shelf. 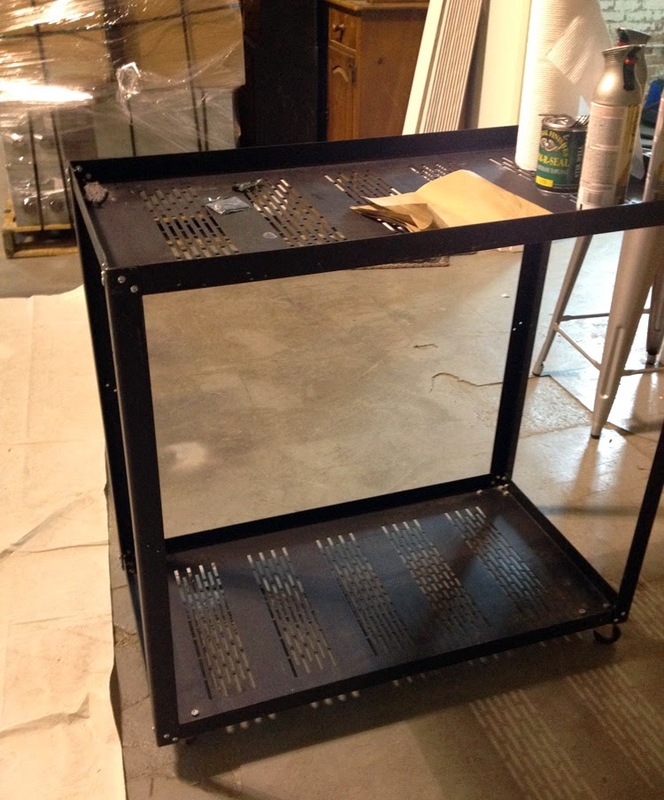 This girl loves industrial design so I sprayed it with Rustoleum's Satin Nickel paint. Not a huge fan of spray paint, but there are times when it is just the right product to use. The top and shelf were stained in dark gray (the top is darker than it appears here) and given several coats of General Finishes Armor Oil and Polyurethane. I was very pleased with the result and can't wait to hear how she reacts (it is a surprise, shhh)! Of course, she needed a bunting in her favorite colors. It is strung together with book page beads, copper tubes and washers. I added little alligator clips to the canvas for her photos, movie tickets, etc. She can hang it anywhere...and here is the before photo of the media cart turned dining table/island. We have five more of these heavy, steel, carts at the studio. One, I have already painted in red and will soon be adding a gray stained oak top and shelf to it as well. Wouldn't this make a great bar or extra work space? I will post photos when it is finished. It will be available for sale in the studio or you can request a custom made one on Etsy. Did you spy those paper place mats? 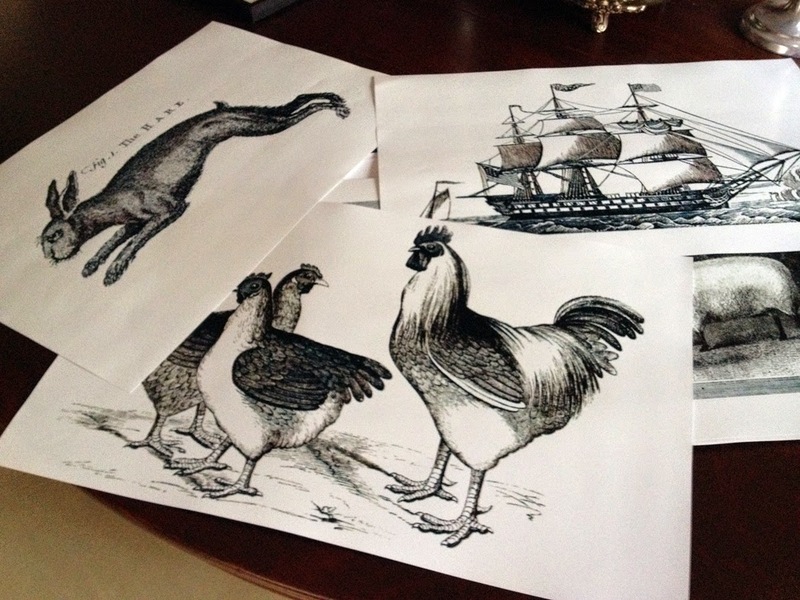 I used heavy tear resistant paper (from my friends at No Other Impression, thank you, Elaine and Doug) to print, copyright free, vintage illustrations (Graphics Fairy, in graphic black and white. They measure 12"x18" and come in a package of 12 ($14.50). Available at méli mélo art studio. I have a variety of images, some are shown here...aren't they fun? I am in the process of setting up summer classes at the Creative Lounge and will have a schedule up shortly. I hope your week is going well...it is finally getting warm here. Yay! Wow! You've been crazy busy too! The bag is so pretty and the cart is just awesome. 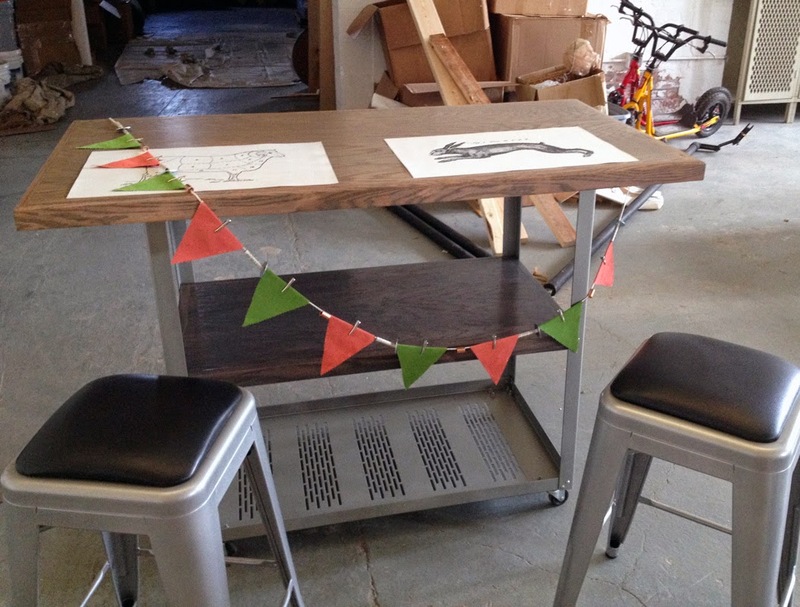 How cool that you made a functional bunting to go with it. Love the images on the placemats. The bunny is my favorite. It's finally getting warm here too. We were away in Maine for a while and we missed a strange heat wave of temps around 90.